back at it again with london fashion week coverage! Oodles of poodles…need I say more? The VIN + OMI show was, as expected, a bonkers bonanza of shape, texture, and colour. It’s perhaps not the most wearable of collections but it’s truly the one I’d most like to wear! 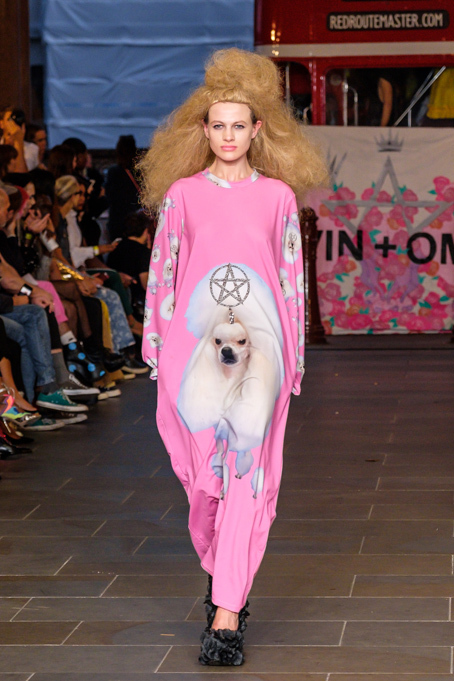 Beyond their fun and quirky designs, VIN + OMI have always been at the forefront of sustainable and responsible fashion and this season, they went above and beyond. 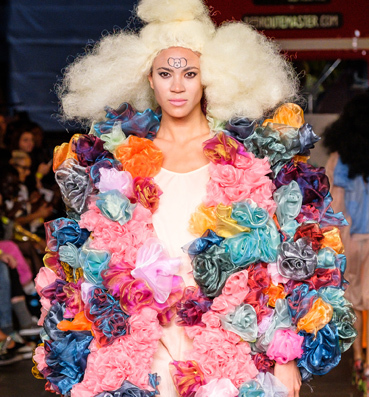 Boasting their largest eco show to date, the textiles are beautiful as well as innovative. 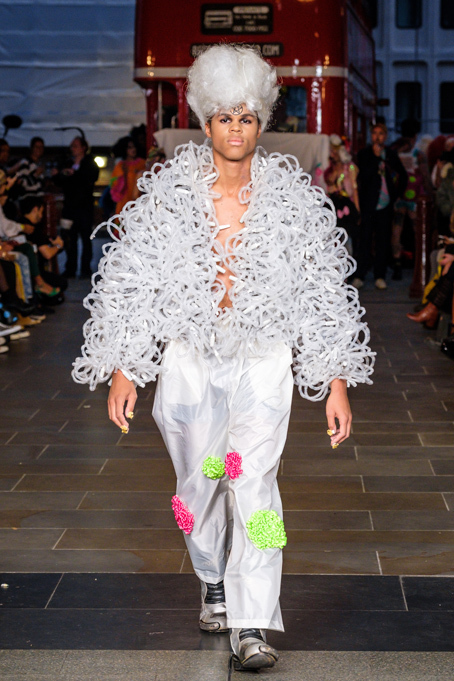 The main items on the catwalk are crafted from rPET textiles, which are made from ocean and river clean up schemes; recycled bottles from last season’s LFWM have been turned into bags; but perhaps the most spectacular garments were those made through the CAN 2 CATWALK project. Besides being cool due to being metal(! ), they’re important because of their story. The fabric that makes up these items was created in conjunction with homeless charities in Birmingham– littered cans are collected and swapped for cash, VIN + OMI then turn those cans into a metal fabric. This scheme is soon going to be introduced nationwide!! In addition to recycled materials, VIN + OMI have introduced new plant-based fabrics this season! They utilise wild plants that grow near their studio- for SS19 we can see nettle, cow parsley, rosebay willow, herb, and flax in varying weaves and finishes. Latex in the collection is grown from their plantation in Malaysia, where workers’ rights are respected and environmental impact is monitored. Recurring motifs throughout are poodles (of course) and pentagrams. Hairstyles were those you’d ordinarily see at Crufts; pentagrams were bright and tongue-in-cheek; and risqué cutouts were the styling choice du jour. 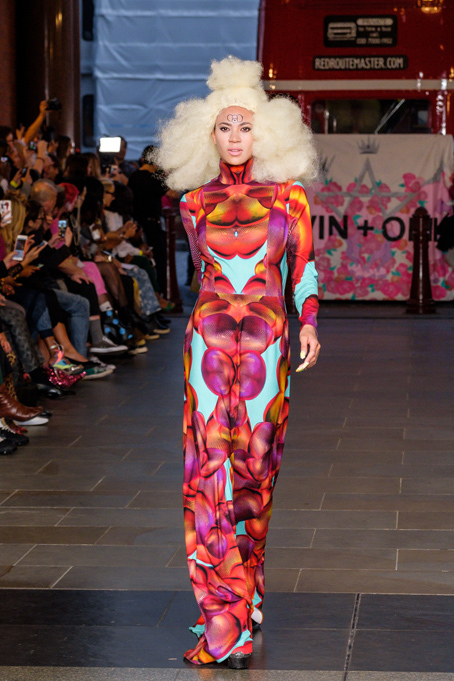 Extravagant, eye-catching, but above all, ethical, VIN + OMI is for sure the show to look out for every season!